BRAND, CULTURE, AND THE POWER OF RELATIONSHIPS - The Rough Notes Company Inc. 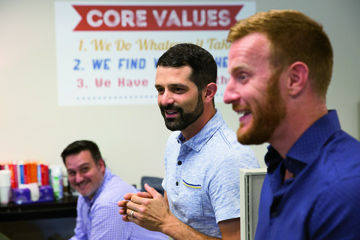 When Matt Naimoli and Zack Gould met, they were friendly competitors at Liberty Mutual, where both were outside sales representatives striving to be the best. As the insurer’s top two agents nationally, they met at company functions for top producers and quickly became fast friends. That led to discussions about future opportunities where they could better utilize their sales acumen and entrepreneurial zeal. The one that stood out was the independent channel, where they would be able to offer more carrier options to clients and also be able to let their entrepreneurship loose and create their own future. 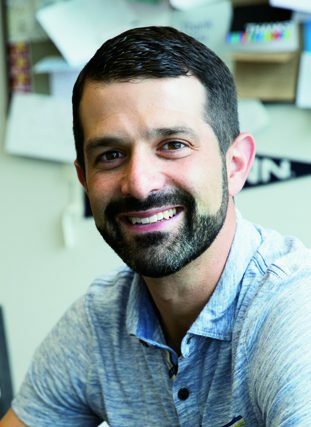 “When we were in the direct-writing channel,” Zack remembers, “we thought about how great it would be to have multiple carriers.” So, in 2010, they left their successful sales jobs and cofounded Southborough, Massachusetts-based G&N Insurance from scratch, with one carrier and no clients. Partners Zack Gould (center) and Matt Naimoli (right) address the team to discuss a company process change to improve efficiency. Sales Coordinator Fernando M. Rey looks on. That wasn’t exactly differentiating them from the competition. 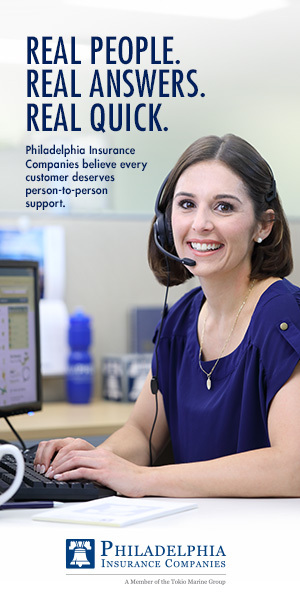 “There had to be a better way to reach clients at a time when the purchase of insurance was top of mind,” Matt says. “Clearly, one of those times was when they were purchasing real estate. The lender made insurance a requirement for every transaction. So we went to mortgage brokers, real estate attorneys and others who were involved in real estate transactions to become the agency they recommended to clients when they were looking for that required coverage. “At the same time, we made great efforts to highlight and emphasize our brand so that we would stay top of mind with these new partners,” Matt continues. “We reached out to mentors in other industries to see what they were saying and doing on the Internet that would help us become a recognized brand. 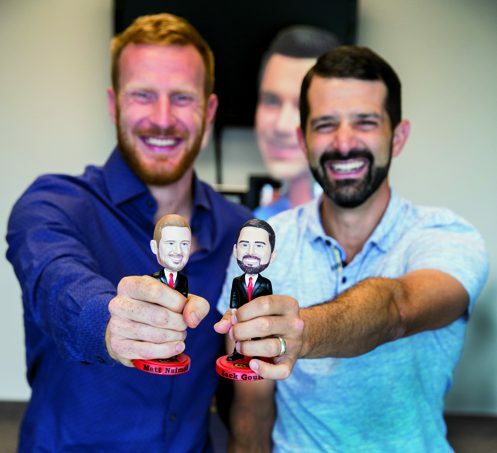 In 2013, G&N insurance began creating custom bobbleheads of staff members and clients who brought them leads. Naimoli, Gould and Sandra Schiloski, Administrative Assistant, display theirs. “One of the things that we noticed about our industry is that there is a significant focus on ROI. Everyone wants to be able to show a tangible result from each dollar of investment,” Zack points out. “That’s an important consideration with certain marketing campaigns, but we chose to adopt a longer-term perspective when it came to our branding strategy. We were going to invest in spreading our brand to our center-of-influence partners and to the potential clients they sent in our direction. Okay, I know that some of you are waiting for a quote from Buffy the Vampire Slayer. Well, I hate to disappoint you, but there won’t be one. I chose regale because it is defined as “to entertain or amuse with talk,” and that’s exactly what the G&N Insurance vlogs do. “What we chose to highlight is strategic and intentional,” Matt points out. “We’re not asking for help or business in the vlog. Instead, we focus on motivational, informational and entertaining content. Zack says that the newest vlogs will show their morning and evening routines “so people can see why we do things. There’s been a lot of talk about transparency in all industries. Well, I would have to say that we are completely transparent. It’s a very noisy world. People crave something real and I think we offer that.” The fact that the G&N Insurance vlogs attract between 10,000 and 20,000 viewers every week certainly backs up that claim. Starting in 2013, G&N Insurance developed a new way to show appreciation and recognize loan officers, real estate agents and attorneys who brought them warm leads. They created custom-made bobbleheads of each one and delivered them to their rightful owners. There is probably nothing that is less like the stodgy image that insurance “enjoys.” This was something unique that underscored the fact that success can be achieved while having fun. That is one of the core values of the agency— to make insurance fun. “We’re doing what we love, and we want every one of our employees to have the same experience,” Zack says. “We were lucky to attract good people, people who believe in our core values and would offer exceptional service to clients, prospects, COIs and one another. And then we lead by stepping back and letting each person shine. Our people feel very valued. You can see that in our videos. We find ways to help. “Sure, we offer company perks like outings and other company-sponsored events, great benefits and a good salary,” Zack continues. “But that’s not what’s really important—it’s what employees should get. The real differentiator that makes our company special is that we focus on delegating and elevating. This lets each person at the agency have a voice in determining the best solutions to their own issues. We support them and, of course, hold them accountable. En route to a meeting with referral partners, Naimoli sets the stage for Video Producer Zach Butlein. 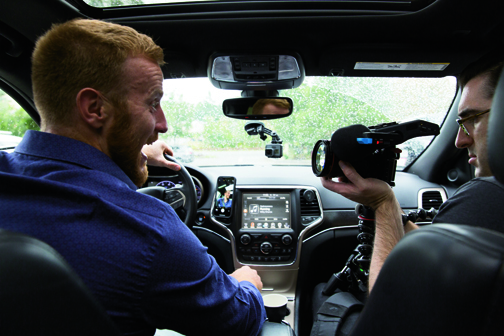 With the agency’s venture into vlogging, they hired a full-time videographer. To date, more than 1,000 bobbleheads of G&N employees and referral partners have been delivered. You can see some of them on most of the social media outlets G&N uses to remain in constant contact with its partners, clients and prospects, including Instagram (#BobbleOn), Facebook, and YouTube. All told, the agency has six platforms of video integration on the Internet. “We have more than 100 referral partners, and they send us more than 500 warm leads every month,” Matt says. “And because clients are referred by trusted partners, our closing ratio tops 75% and our retention rate is at an industry-leading 96%. We have more than 10,000 clients. We’re writing between $125,000 and $150,000 in new business premium every week, and it’s staying with us. A selfie on the roof with referral partners in conveyance, mortgage lending and real estate. “We don’t worry about GEICO because, despite their huge resources, GEICO just can’t compete with us locally,” he adds. And today, “locally” means all of New England. In Massachusetts, the agency insures more than 7% of all real estate transactions annually. And it started out with nothing in 2010. Perhaps more important, because they are having fun, Matt and Zack want to share their experience with agencies around the country. They aren’t hiding their “secret sauce”; they’re offering it to everyone. They coach and mentor more than 100 agencies nationwide for free and have presented their program at agency conferences from coast to coast. 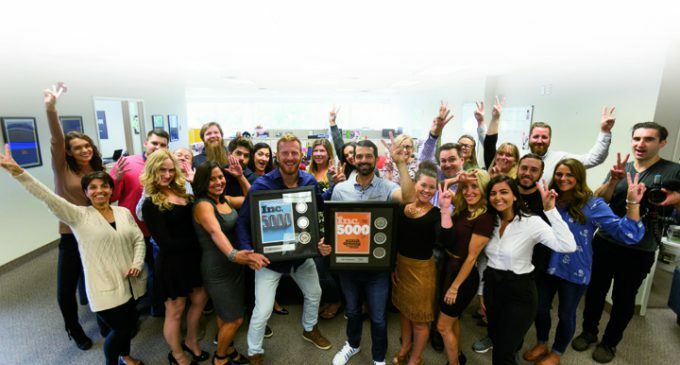 They epitomize the “friendly competition” that has been a hallmark of the independent agency system, where successful agencies have gone out of their way to help others succeed. They also epitomize the generosity that independent agents have shown by supporting more than a dozen local charities with both time and dollars. The agency has enjoyed annual growth of 35% to 40% since its start. That’s growth in policy count, premiums and revenues. 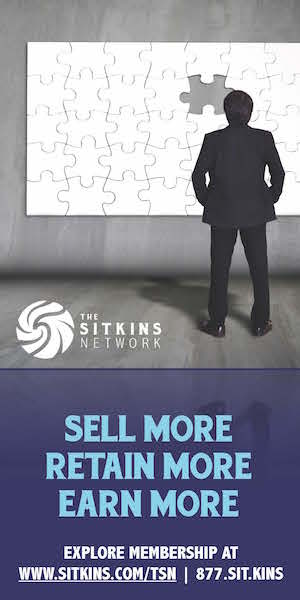 And it’s all thanks to a grassroots networking effort that uses both social media and shoe leather to reach centers of influence within a niche who can generate warm referrals. G&N has shown the way that businesses can use social media to brand and broadcast within a vertical market. 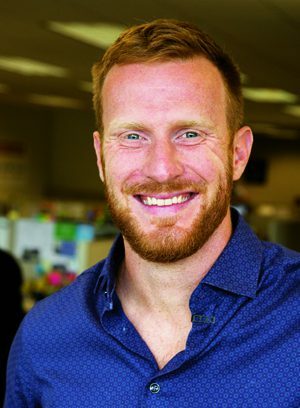 There’s more than one way to succeed in the independent agency business, and G&N Insurance is offering a unique, exciting and fun way to do that. Matt and Zack are committed to working with agencies to help them join in transforming the industry. “We are large and we’re growing at a rapid clip, but our most valuable asset is our brand. Our brand is the best hedge against disruption, so our ability to articulate who we are allows us to differentiate against competition and strengthen our position as a niche expert. There is no better way to showcase what makes you special than using video and social media to broadcast your brand and culture,” Matt concludes. G&N Insurance is offering agencies an alternative way of doing business that has certainly been successful for them. Time will tell if it is the future of the business or one of many futures as other independent agencies experiment with new ways of reaching clients and prospects. Zack concludes by saying “We’re excited about where we are going next.” Stay tuned. And we conclude by saying that G&N definitely deserves recognition as the Rough Notes Agency of the Month.